Was tonight’s episode the end for the Salvation TV show? Viewers of the CBS summer drama series were likely shocked by tonight’s finale and it seems unlikely that the cliffhanger will ever be resolved. Do you think the network should renew Salvation for a third season, despite some very low ratings? A CBS suspense drama, Salvation, stars Santiago Cabrera, Jennifer Finnigan, Charlie Rowe, Jacqueline Byers, Melia Kreiling, Ashley Thomas, and Ian Anthony Dale. The thriller follows MIT graduate student Liam Cole (Rowe) and tech genius Darius Tanz (Cabrera), who discover that in six months, a huge asteroid will crash into the Earth. In season two, the truth is out. Now that it is no longer a secret, the impending threat elicits both the best and worst from humanity. The TV series debuted in July 2017 and drew pretty mediocre ratings right from the start with a 0.70 rating in the 18-489 demographic and 4.90 million viewers. The numbers didn’t get any better as the season progressed and ended up averaging a 0.52 in the demo with 3.53 million. 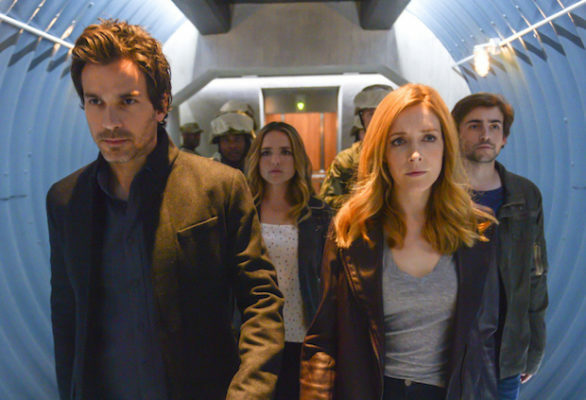 Despite the lackluster ratings, Salvation scored a second season renewal. In season two, the ratings have been even lower. The 12 episodes that have aired thus far have averaged a 0.33 demo rating with 2.67 million viewers. Compared to the first season’s numbers, that’s down by 38% and 24%, respectively. It’s unclear if CBS Television Studios has a special streaming deal that would help reduce some of the production costs for this series (ala Zoo) but it seems clear that the regular commercial ratings aren’t strong enough to land Salvation a third season. But, what do you think? Do you think that Salvation should be cancelled or, renewed for a third season — despite the low ratings? Would you watch season three? Lethal Weapon: Cancelled or Renewed for Season Three without Clayne Crawford?